KRCL Notification is out. KRCL is recruiting for 37 Technical Assistant Govt Job Posts. 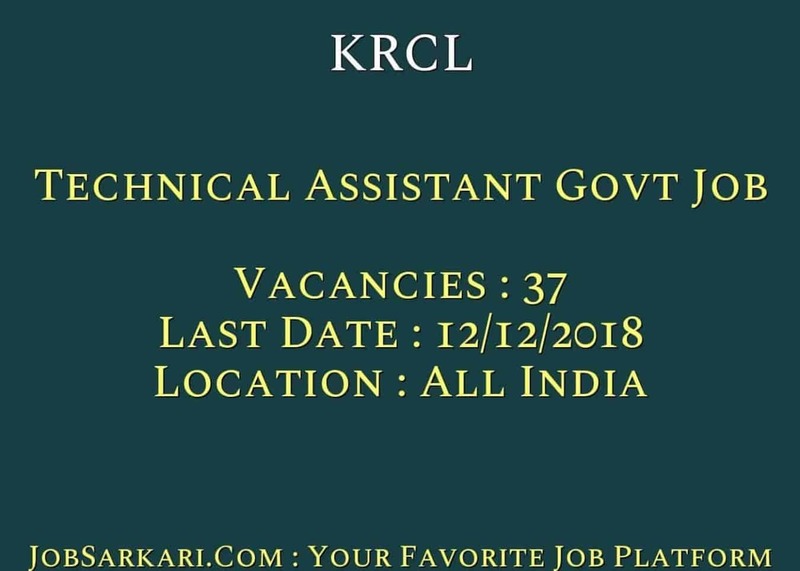 You can check KRCL - Konkan Railway Corporation Limited last date, download KRCL notification, visit KRCL official website and check other KRCL Vacancy details.Complete Vacancy and recruitment Details about 37 Technical Assistant Govt Job vacancies in KRCL are provided below by JobSarkari.Com only for you. Date of Interview 19/11/2018 to 12/12/2018. Assistant/ Electrical Candidate Must Have Passed B.E. / B.Tech in Electronics / Power Electronics / Industrial Electronics With 60% Marks With Two Years of Experience in Construction / Maintenance. 04. 19/11/2018, 09:30 AM. Jr. Technical Assistant/ Electrical Candidate Must Have Passed B.E. / B.Tech in Electronics / Power Electronics / Industrial Electronics With 60% Marks. 07. 21/11/2018, 09:30 AM. Sr. Technical Assistant/Signal & Telecommunication Candidate Must Have Passed B.E. / B.Tech in Electronics / Communication With 60% Marks. 01. 26/11/2018, 09:30 AM. Signal &Telecommunication Candidate Must Have Passed B.E. / B.Tech in Electronics / Communication With 60% Marks. 02. 28/11/2018, 09:30 AM. Candidate Must Have Passed B.E. / B.Tech in Civil With 60% Marks and Having 02 Years Experience in Civil Construction. 14. 03/12/2018, 09:30 AM. Jr. Technical Assistant (Civil) Candidate Must Have Passed B.E. / B.Tech in Civil With 60% Marks. 02. 05/12/2018, 09:30 AM. Candidate Must Have Passed Diploma in Electrical / Electronics / Micro Processor / Industrial Electronics / TV Engineering / Fiber Optic Communication / Electronics Instrumentation and Having Two Years Experience in Construction Projects. 03. 10/12/2018, 09:30 AM. (Signal & Telecommunication) Candidate Must Have Passed Class 10th and ITI in Electrician/Electrical fitter/ Wireman / Electronics / Information Technology / TV With Two Years Experience in Construction Projects. 04. 12/12/2018, 09:30 AM. Total No of Post 37. Age Limit as on 01/09/2018. Maximum Age for Sr. Technical Assistant Max 30 Years. Maximum Age for Jr. Technical Assistant / Sr. Assistant Technician and Assistant Technician Max 25 Years. 4. Candidate Need to Walk-in-Interview Along With Required Documents to the Address Given Below. Venue of Interview -USBRL Project Head Office, Konkan Railway Corporation Ltd., Satyam Complex, Marble Market Extension- Trikuta Nagar, Jammu. Jammu & Kashmir. Q. What is the Last Date For KRCL Technical Assistant Govt Job Vacancy ? A. 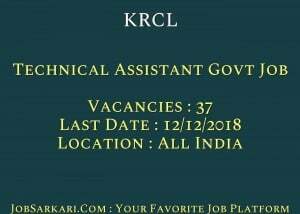 Last Date for KRCL Technical Assistant Govt Job Posts is 12/12/2018. Q. What is the Form Type of KRCL Technical Assistant Govt Job Recruitment ? A. The Form Type for KRCL Technical Assistant Govt Job Posts is Online. Q. How many vacancies are available in Konkan Railway Corporation Limited Technical Assistant Govt Job Posts ? A. There are about 37 Vacancies in Konkan Railway Corporation Limited Technical Assistant Govt Job Posts. Q. What is the Full Form of KRCL ? A. Full Form of KRCL is Konkan Railway Corporation Limited .